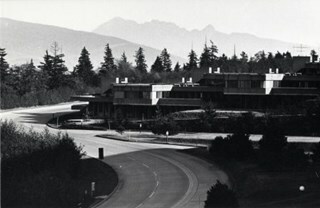 "Burnaby - 8888 University Drive"
The planning, design concept, design coordination, site development and landscaping for the original part of the campus were all under the control of Erickson/Massey. 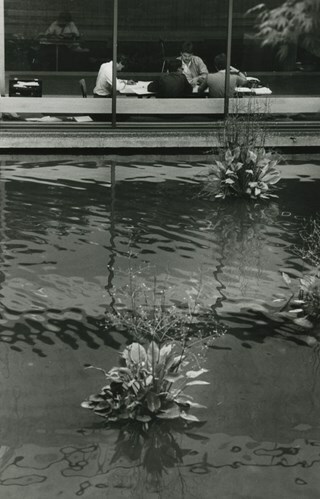 The complex was conceived as one building, with future growth occurring at the periphery. Tall buildings would have been out of scale with the massive mountaintop ridge, so a series of horizontal terraced structures were designed that hugged the ridge and dissolve into the landscape. 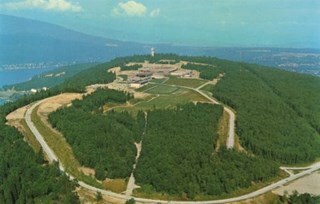 Following the linear peak of the mountain, the scheme organized various parts of the campus along an east/west line. 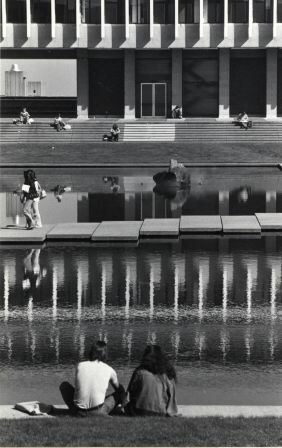 The concept of a central academic quadrangle was conceived within the tradition of Oxford and Cambridge, and to enhance the sense of contemplative quiet, it was designed as a perfect square raised on massive pilotis, allowing stunning views through a landscaped courtyard. 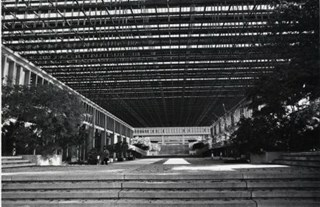 The connecting link was a gigantic space frame-developed in conjunction with Jeffrey Lindsay, a one-time associate of Buckminster Fuller-that provided shelter and a gathering-place for the students. 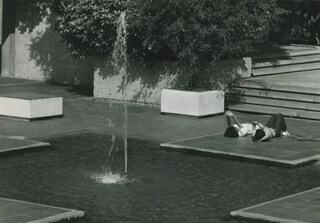 Other architects who had placed among the top five in the competition were retained to design the individual components of the original plan: the Academic Quadrangle by Zoltan S. Kiss; the Theatre, Gymnasium & Swimming Pool by Duncan McNab & Associates; the Science Complex by Rhone & Iredale; and the Library by Robert F. Harrison. 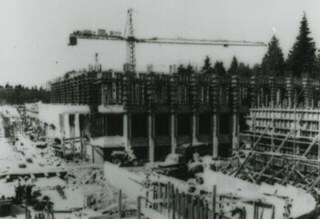 Following the end of the Second World War, there was unprecedented growth throughout the Lower Mainland. Many returning veterans had settled on the coast, and the loosening of wartime restrictions led to the creation of many new suburban developments throughout the region. The growing population strained existing facilities, and there was a recognition that new educational facilities had to be constructed to meet these growing demands. 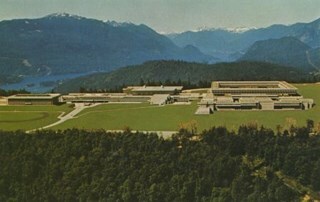 For many years, the only university in the province was the University of British Columbia. 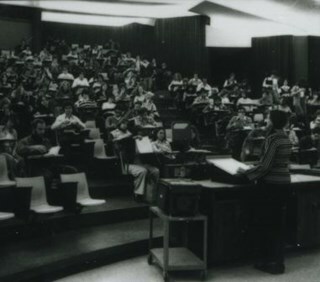 In the 1960s, new universities were planned for both Victoria and Burnaby to serve the wave of baby boomers just then going through high school. 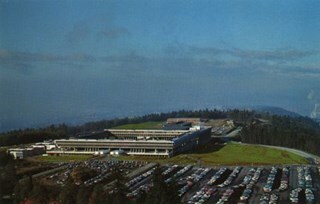 The dramatic site chosen for the Burnaby university was the top of Burnaby Mountain, with expansive views over mountain ranges and water. 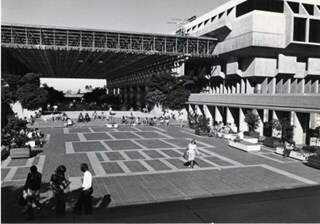 An architectural competition was held for a campus of 7,000 students that could eventually be expanded to 18,000. Of the many submissions, the judges reached unanimity on the winner, an outstanding scheme submitted by the firm of Erickson/Massey. The judges went even further, and recommended that every effort be made to ensure that the winning design be built as submitted. The new Chancellor, Gordon Shrum, agreed. 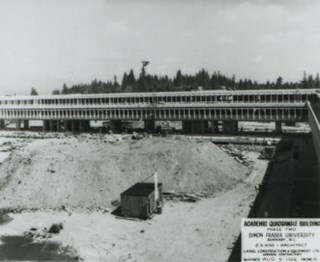 The realization of this scheme won extensive recognition for the work of Arthur Erickson and Geoffrey Massey, and launched Erickson’s international career. 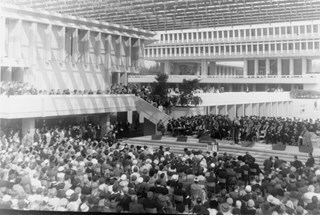 In Erickson’s words: "Unlike any previous university, Simon Fraser is a direct translation into architecture of the expanding fields of knowledge that defy traditional boundaries, of the vital role of the university as both challenger and conservor of human culture, and of the university community as one in constant intellectual, spiritual and social interchange." 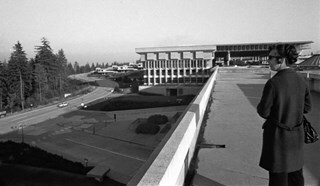 The new school opened for classes in September 1965, nicknamed the “instant university,” and quickly gained a radical reputation. 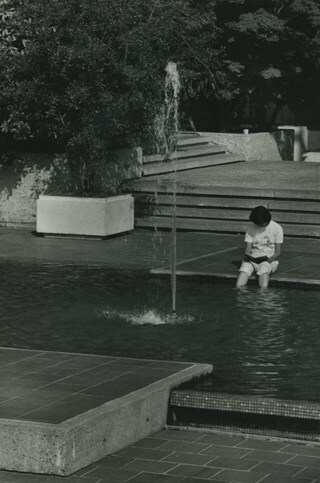 The startling futuristic architecture and open layout suited the explosive nature of the mid-1960s, when political and social traditions of all types were being questioned and student protests were common. 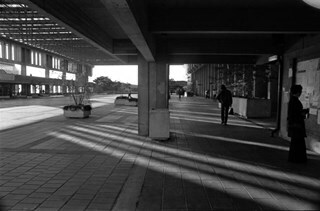 Many of SFU’s programs were considered experimental, even controversial, and unrest and conflict on the campus continued for a number of years. 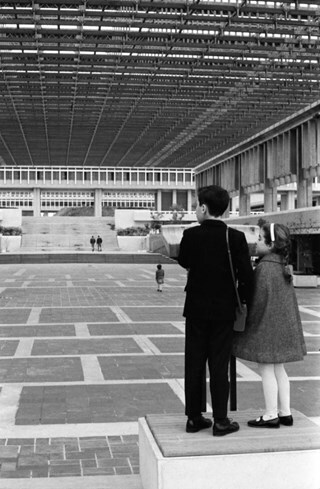 Since this auspicious beginning 40 years ago, SFU has grown to house 25,000 students on three campuses. The core of the original campus, recognized world-wide as a profound work of architecture, remains essentially intact today. Photograph of Simon Fraser University (SFU) president, Patrick D. McTaggart Cowan, donating blood. 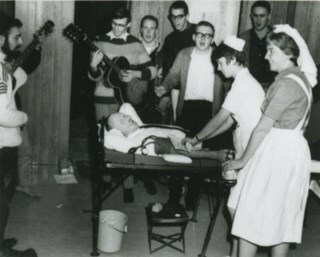 A group of students in the background are playing guitars and singing. 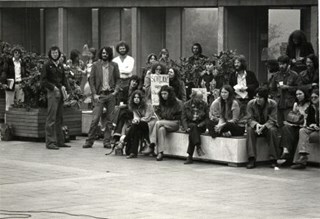 Photograph of students at a lunchtime dance at the outside mall at Simon Fraser University (SFU). 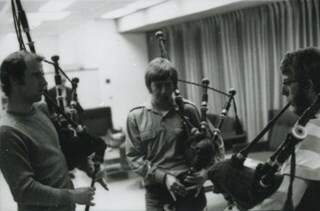 Photograph of a Simon Fraser University Pipe Band bagpipe practice with; Malcolm (last name unknown), Bill Poppy and Tom McMath. Photograph of Burnaby Villa bellboys Tony Urquart (front) and Rocky Adams as they prepare to set off from Simon Fraser University on a cross-Canada bicycle trip. A crowd, including the Queen of Burnaby, has gathered to see them off. 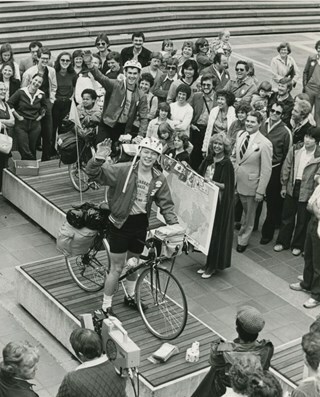 Newspaper clipping attached to verso of photograph reads: "READY, SET ... Burnaby Villa bellboys Tony Urquart (front) and Rocky Adams prepare to set off from Simon Fraser University on a cross-Canada bicycle trip as part of SFU's Ethnic Day, Sunday, held as part of Burnay days '80. But not before a warming kiss from the Queen of Burnaby." Photograph of Daniel George (Chief Dan George), an actor and chief of the Tsleil-Waututh Nation from 1951 to 1963. Beside him is Willard Ireland, British Columbia's Provincial Librarian and Archivist from 1946 to 1974, and Margaret (Ma) Murray, co-founder and editor of newspapers such as the Bridge River-Lillooet News and the Alaska Highway News, with membership in the Order of Canada. 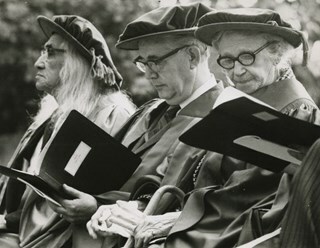 They are wearing graduation gowns and Cambridge bonnets as they each receive honorary degrees from Simon Fraser University. 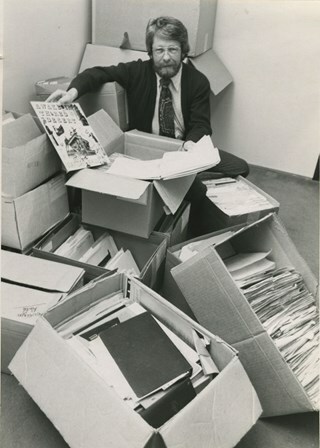 Photograph of Simon Fraser University Humanities Library head Gene Bridwell surrounded by open boxes of a new acquisition; manuscripts and correspondence from Talonbooks. 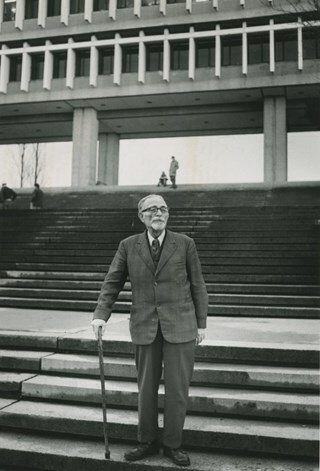 Newspaper clipping attached to verso of photograph reads: "Mammoth sorting job awaits Simon Fraser University Humanities Library head Gene Bridwell as he starts to open 21 boxes of eight years worth of original manuscripts and correspondence from Western Canada's largest literary publisher, Talonbooks, which the library purchased for $10,000." Photograph of Simon Fraser University track coach Hal Werner and team member Mike Boni jumping on a trampoline as part of a "bounce-a-thon" to raise money for a trip to Mexico. 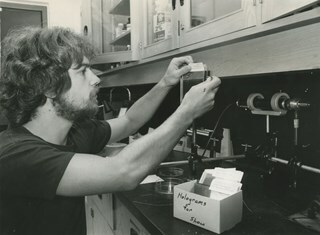 Newspaper clipping attached to verso of photograph reads: "Up in the air with enthusiasm over last fund raising effort at SFU are Hal Werner, coach of SFU's track team and team member Mike Boni. Team concoted idea of bounce-a-thon to raise money for trip to Mexico after money for trip was stolen following an earlier fundraising dance." 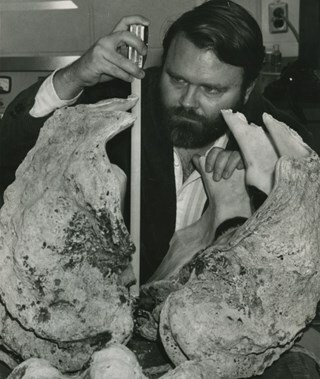 Photograph of Simon Fraser University biology professor Peter Frankboner examining a pair of giant clams native to the South Pacific atolls. "It is believed that unless killed by some outside cause, the giant clams live forever. Frankboner hopes to gain information about aging from the clams." Newspaper clipping attached to verso of photograph reads: "SOME CLAM, SOME CHOWDER...SFU biology professor Peter Frankboner examines a pair of giant clams native to the South Pacific atolls. The clams, which he describes as 'miraculous creatures' grow to 4 1/2 feet and can weigh 1,000 pounds. It is believed that unless killed by some outside cause, the giant clams live forever. Frankboner hopes to gain information about aging from the clams." 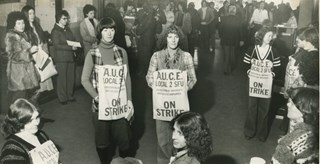 Photograph of members of the Association of University and College Employees (AUCE) picketing in front of the registrar's office at Simon Fraser University, as students line up to register for classes. These members of the AUCE are the non-teaching employees of Simon Fraser University. 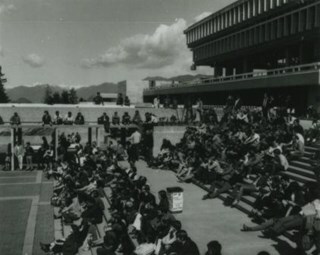 Newspaper clipping attached to verso of photograph reads: "STUDENTS QUEUE DESPITE STRIKE...Hundreds of Simon Fraser University students lined up to register this morning for the spring term while striking non-teaching employees quietly picketed in front of the registrar's office. Strikers did not interfere with registration, although office hours have been cut back. 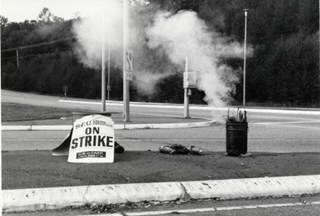 The strikers, members of the Association of University and College Employees, have been off work since Dec. 5." 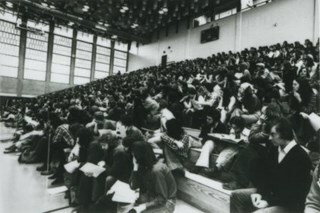 Photograph of a large group of Simon Fraser Unversity students sitting on bleachers. Towards the back of the group are students holding up a large sign which reads; "EVERYBODY OUT! THURSDAY 10 AM MAR. 22 / PICKETLINE DEMONSTRATON / END THE STRIKE!" 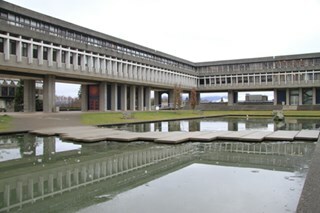 The non-teaching employees of Simon Fraser University who were striking were members of the Association of University and College Employees (AUCE). 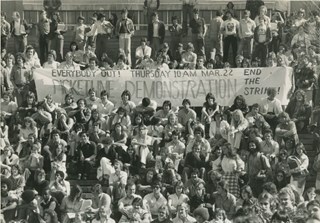 Newspaper clipping attached to verso of photograph reads: "A banner advertising today's demonstration in support of SFU strikers attracts attention from students at yesterday's anti strike rally." Photograph of four members of the Kenwards of Port Moody. 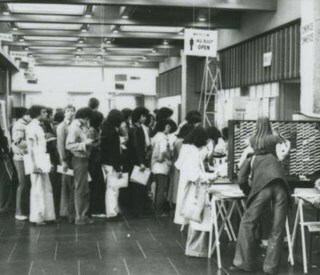 At the time this photograph was taken, they were each at various stages of post-secondary education at Simon Fraser University. 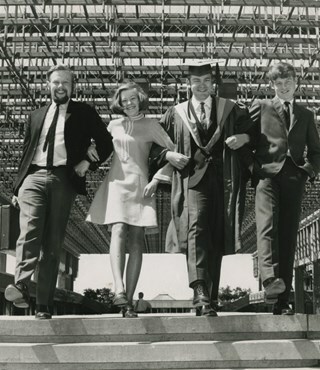 John (far left) a graduate student; Diane, who was to start at SFU the following February; Dave, graduating that year (in cap and gown); and Peter, who was just completing his first year. 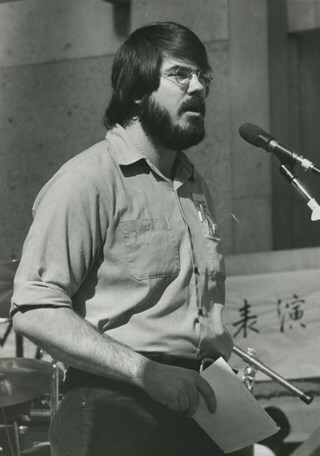 Photograph of rally moderator Larry Pierce speaking at a microphone during the strike at Simon Fraser University. 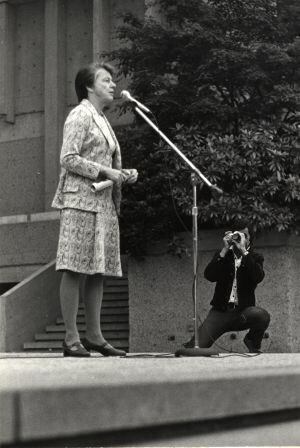 Note on recto of photograph reads: "Larry Pierce - Rally Moderator"
Photograph of Governor General Roland Michener and his wife Norah Michener, taken on a Simon Fraser University campus tour by the vice-president of university services Stan Roberts and his wife Pia. Pia Roberts is wearing a patterned dress and is standing between the Governor General and Norah Michener. 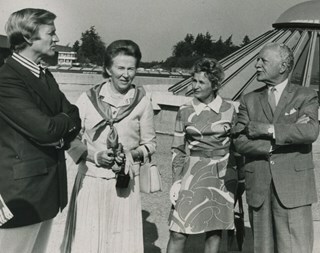 Newspaper clipping attached to verso of photograph reads: "Stan Roberts, vice-president, SFU university services, and his wife, Pia (between Governor-General and Mrs. Michener) took the vice-regal visitors on a Simon Fraser campus sightseeing tour on Monday. 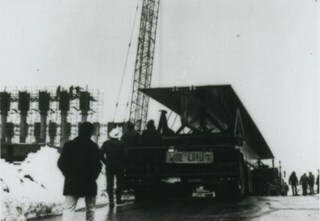 They are pictured on top of the rotunda. Earlier Mr. Michener presented Malcolm Aspelet with the Stanhope Gold Medal, the Roual [sic] Humane Society's top bravery award, at a ceremony in Vancouver. Mr. Aspelet was severely mauled while saving his hiking companion, Barbara Beck (now his wife) from a grizzly's attack in Glacier National park in 1971." Photograph of the Women's Athletic Coordinator at Simon Fraser University, Barbara Robertson, sitting on the bleachers in the Simon Fraser University gymnasium. 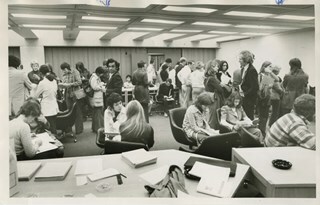 Photograph of representatives from Simon Fraser University Faculties Admissions Office, holding an 'information day' and swamped with prospective students seeking advice and consultation. Newspaper clipping attached to verso of photograph reads: "INFORMATION / DAY AT SFU / Expecting about 24 people, representatives from Simon Fraser University Faculties Admissions Office held an 'information day' Sunday, and were swamped with prospective students seeking advice and consultation. The Academic Advice Centre will be open until 9:30 p.m. from today to Oct. 25."